Functionally coupled biomechanical systems are widespread in nature and are viewed as major constraints on evolutionary diversification, yet there have been few attempts to explore the implications of performing multiple functions within a single anatomical structure. Paternally mouthbrooding cardinalfishes present an ideal system to investigate the constraints of functional coupling as the oral jaws of male fishes are directly responsible for both feeding and reproductive functions. To test the effects of (i) mouthbrooding on feeding and (ii) feeding on reproductive potential we compared the feeding apparatus between sexes of nine species of cardinalfish and compared brood characteristics among species from different trophic groups, respectively. Mouthbrooding was strongly associated with the morphology of the feeding apparatus in males. Male cardinalfishes possessed longer heads, snouts and jaws than female conspecifics irrespective of body size, trophic group or evolutionary history. Conversely, reproductive potential also appeared to be related to trophic morphology. Piscivorous cardinalfishes produced larger, but fewer eggs, and had smaller brood volumes than species from the two invertebrate feeding groups. 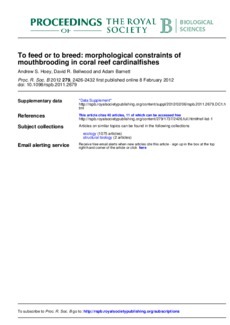 These interrelationships suggest that feeding and reproduction in the mouth of cardinalfishes may be tightly coupled. If so this may, in part, have contributed to the limited morphological diversification exhibited by cardinalfishes.